Stupa, the sacred temple of Buddhist is built in accurate uniformity around the world. 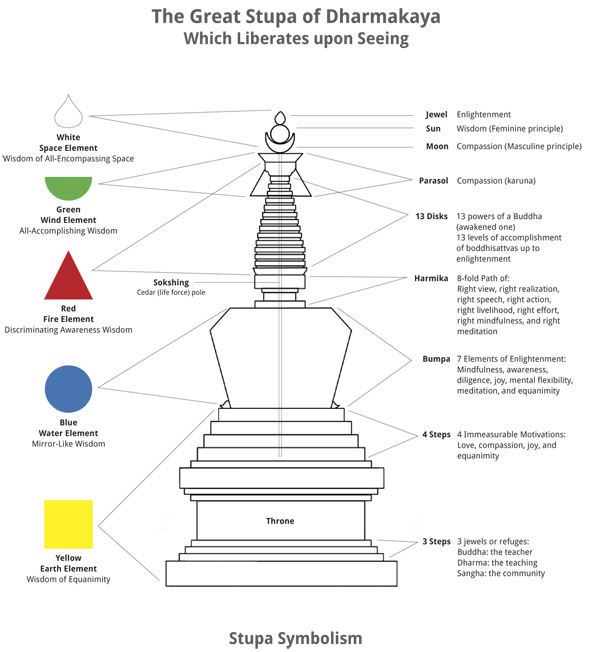 While a stupa can be in various sizes, the shape/design must follow the universal pattern. This is because, a stupa carries Buddhist message. Each and every part of the stupa has a symbolic meaning connecting to Buddhist teaching. Stupa is a Sanskrit word that means “to heap” or “to pile up” and refers to the mound-like shape of the earliest stupas. 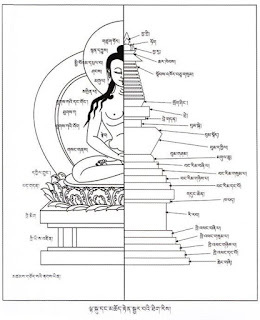 The Mahaparinirvana Sutra tells us that it was the Buddha himself who outlined the basic design of the stupa. The story begins at Buddha’s deathbed. 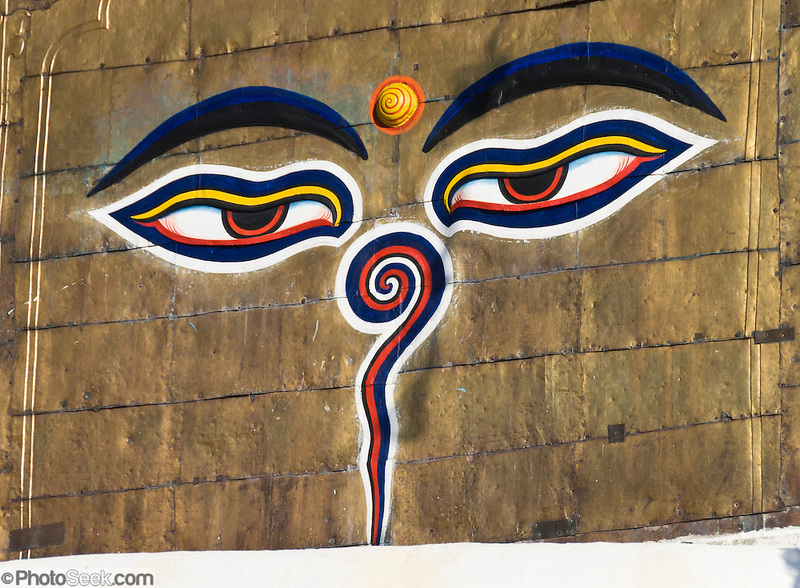 When he realized that death was imminent, Buddha gave instructions about the disposition of his body. He said that his body should be cremated and the relics divided up and enclosed in four different monuments. 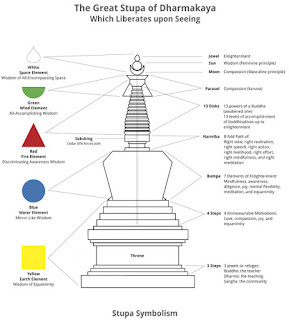 These monuments were to be erected at the following places, marking important milestones in the Buddha’s spiritual journey: at Lumbini, where he was born; at Bodhgaya where he attained Enlightenment; at Sarnath, where he gave his first teaching; and at Kushinagar, where he died, entering parinirvana, or ultimate liberation. Giving a practical demonstration, he folded his outer yellow robe over and over until it became a rough cube. Then he put his begging bowl over it. 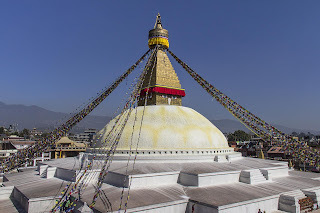 These two elements, the square and the dome, are present in every stupa (India), dagoba (Sri Lanka), chorten (Tibet), chedi or pagoda (Burma), t’ap (Korea), ta (China), tarp (Vietnam), thaat (Laos), sotoba (Japan), or chandi (Java). The stupa, universal throughout Asia, evolved into more than a reliquary monument. It has become an expression of the ideal of Enlightenment. Statues represent the Buddha’s body, Dharma texts his speech. 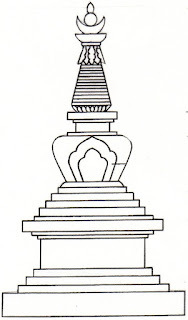 Stupas are representations of the Buddha’s mind. They reveal the path to enlightenment, or how the mind can actualize its full potential and be transformed into enlightenment. 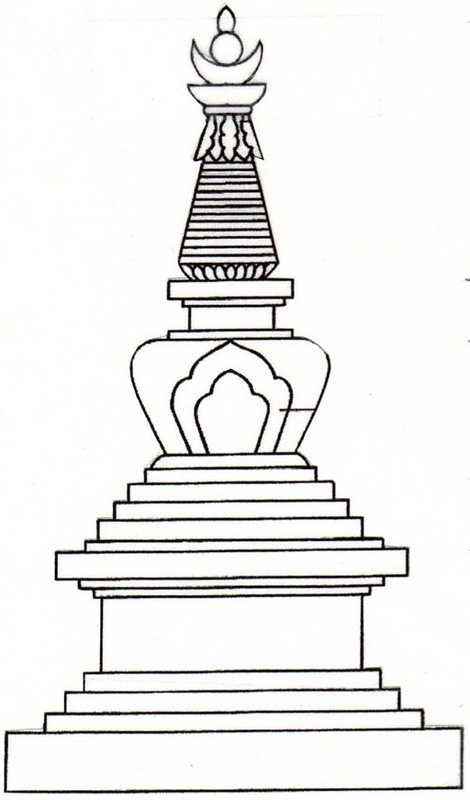 Stupas can be seen as an expression of the five elements. § Earth, which spreads out in the four directions, provides the solid basis. § The dome is the garbha (“womb”), primordial, creative Water – formless potentiality. It is also called the anda, or egg. § The conical spire is Fire, which always rises upwards. It represents the wisdom which burns away ignorance. § The crescent moon is Air, expansive, waxing and waning (an ancient symbol of the feminine). 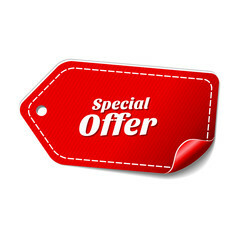 § The circle is Space, wholeness, totality, with no end or beginning. § Finally, above the circle is a jewel, which represents a higher state of reality, gone beyond the five elements. It is the ushnisha, present on the crowns of all Buddhas, revealing their perfect, enlightened state. 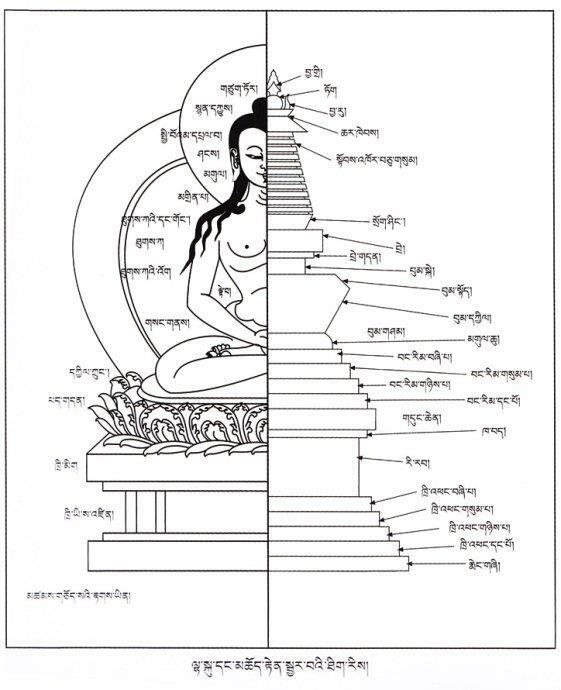 This ascent to perfection is laid out with precision in an Enlightenment stupa. 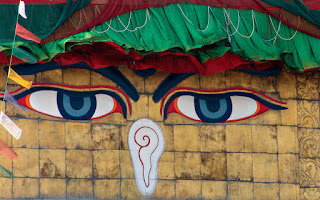 A pair of Eyes: The Buddha’s eyes are so mesmerizing that you feel they are looking at you if you look at it. The eyes are in fact looking at the universe in compassion. Questioning Nose: The nose looks like a question mark. It is indeed a question. The enlightened and compassionate eyes are looking at you with a question “who are You?” Obviously, this is a million Dollar Question. 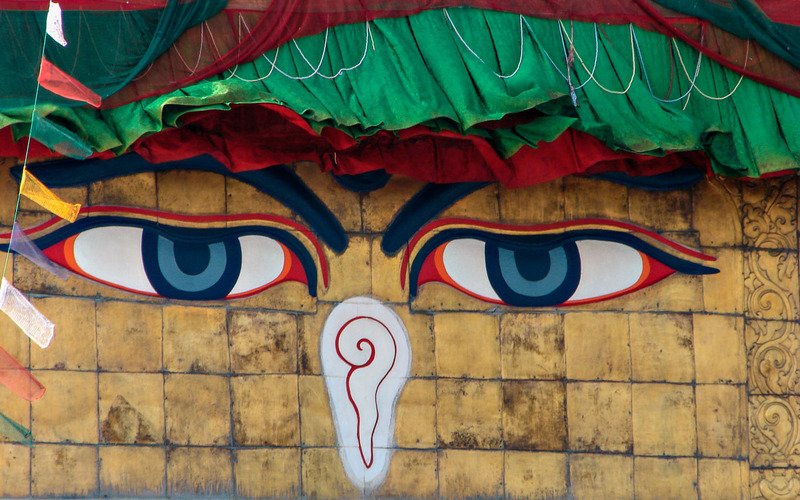 The Buddha’s teaching is focused on the fact that we are not what we think we are. We take our mind and body as our real entity. But, Buddha says, we are never a body or mind. Mind and body is impermanent. In absence of mind and body, what you can realize is the real existence. 13 Rings: The thirteen rings symbolize the ten mystic powers (they are also known as Paramitas or perfection. The ten perfection mentioned in the Buddhism are: Dana, Sila, Nekkhamma, Pana, Viriya, Khanti, Sacca, Adhitthana, Metta, Upekkha) and the three essential types of mindfulness. They also symbolize the thirteen Bhumi. In other words, the thirteen rings are thirteen stages of mind or thirteen stages of mind that one goes through before attaining enlightenment. Buddhism appeals all the people in the world to know their real existence. The answer to the question “who are you?” can be found through “Sila” ( way of life) and “Dhyan” (meditation). The top : The top is the position of enlightenment. After accomplishment of 13 different stages comes the top, the Enlightenment. 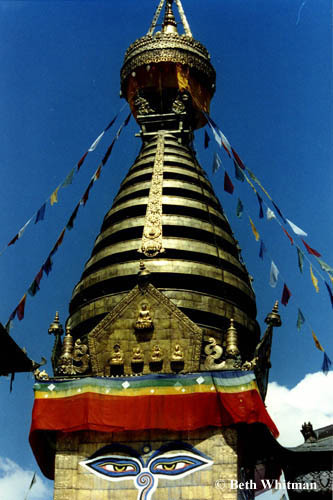 The top most part of stupa contains an Umbrell that symbolizes the victorious state of Enlightment. Similarly, the moon symbolizes the elimination of all sufferings, while the sun symbolizes the radiance of the thousand lights of compassion. The nada (the jewel) symbolizes the realization of all the aspirations. Know about Lukla flight schedule from April 1 to June 30.